Malcolm Turnbull has refused to support a referendum on enshrining an Indigenous “voice to parliament” in the Australian constitution. 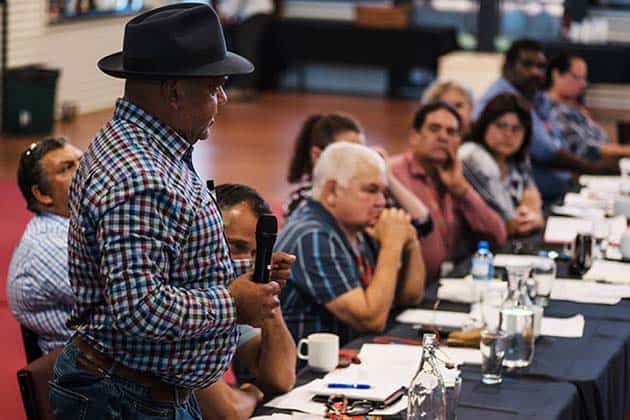 The proposal was recommended by the government appointed Referendum Council, after a two year consultation process with Aboriginal communities, culminating in the convention that issued the “Uluru statement from the Heart” in May. Turnbull argued an Indigenous “voice” would “undermine the universal principles… of equal civic rights”. This is rank hypocrisy from the leader of a government brutally discriminating against Aboriginal people in all areas of life and presiding over the apartheid of the continuing NT Intervention. But the “voice” would have done nothing to address these injustices, offering no rights and no real power to Aboriginal people. The proposed amendment to the constitution specified that the “voice” would only have advise government on legislation—advice they could simply ignore. The government of the day would retain the power to disband any “voice” that became too radical and hand pick a new one. Through the consultations, Aboriginal people across the country rejected the idea of tokenistic “recognition” in the constitution, demanding power over their own affairs and the negotiation of treaties. But key leaders involved in the Referendum Council process were convinced by the argument of conservative Indigenous leader Noel Pearson that only the moderate “voice” proposal, which he designed to appeal to the Liberal and National parties, would have any chance of success at a referendum. This conservative strategy has now blown up in Pearson’s face. The Labor Party have played cynical politics with the “voice” proposal, criticising Turnbull for failing to accept it, but making no guarantees they will put it to a referendum if they win the next election. “Constitutional reform” has been promoted by successive governments for a decade, to distract from the daily atrocities committed against Aboriginal people. Stopping these injustices and winning real self-determination will only come through building resistance on the streets.